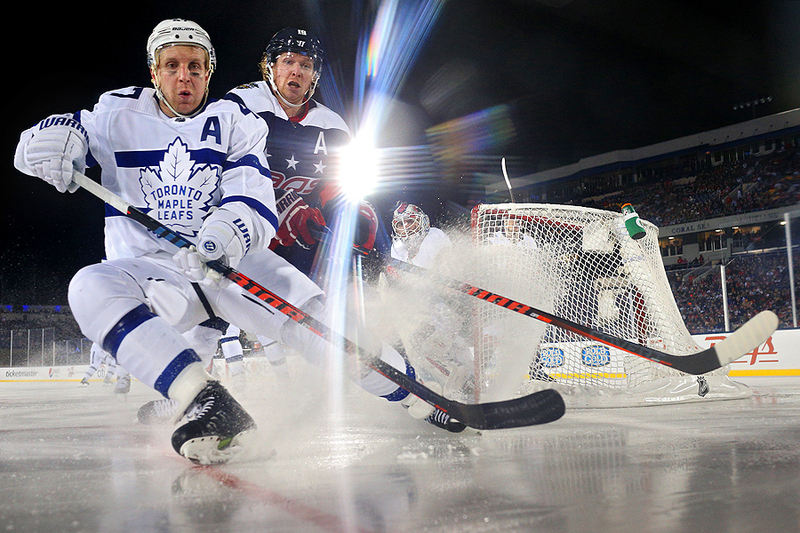 "Leo Komarov #47 of the Toronto Maple Leafs and Nicklas Backstrom #19 of the Washington Capitals battle for the puck during the third period in the Coors Light NHL Stadium Series at Navy-Marine Corps Memorial Stadium on March 3, 2018 in Annapolis, Maryland." Every once in a while an new opportunity within a fresh assignment occurs that helps make a different picture. During the Coors Light NHL Stadium Series at Navy-Marine Corps Memorial Stadium, a rare remote camera position was offered to us - this being the dasher camera. This is a hole cutout along the bottom side of the boards. While few arenas have them, the outdoor rink is one that helps create this type of image. While not anything ground breaking, what I did like about the above is that it incorporates lens flare from the stadium lighting. In addition, a cleaner background than a typical indoor venue. Always fun to try something new and have it be a successful image.